Dent is one of the three gym leaders of Striaton City. 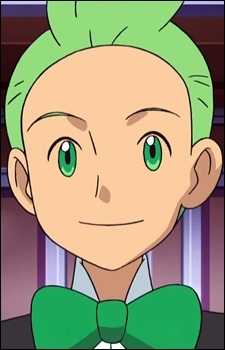 He is the brother of Pod and Corn, his fellow gym leaders. He is recognized as an A-rank Pokemon Sommelier, a person who has the ability to check the compatibility and closeness between a trainer and his/her Pokemon. After being defeated by Ash in a gym battle he decided to join Ash through his journey in the Unova Region. He is the group's navigator and cook. Dent has a love for playing detective and trains. He enjoys solving mysteries with scientific explanations, and he is a huge fan of Nimbasa City's subway system. He dislikes the Pokemon Purrloin, saying he had a bad experience with one in the past, but refuses to talk about it. Dent's vintage Pokemon is his Pansage. He has also acquired a Dwebble, which has evolved into a Crustle, and a Stunfisk while traveling.